THE mother of an Irish aid worker who died on an Ethiopian Airlines plane which crashed just minutes after takeoff has spoken of her heartbreak at the tragedy. Christine Ryan, a retired Clare schoolteacher, said her son, Mick (39), wanted to "save the world" through his work with the UN. Tragically, her son was due to travel to Rome at the end of the month to mark his 40th birthday - and to celebrate the christening of his young son. Mick was one of 157 people who were killed on board. This morning air crash investigators have recovered the black box of the Ethiopian Airlines flight. Mrs Ryan paid an emotional tribute to her son and said they were totally devastated by what happened. "He loved Lahinch, he loved Clare - he loved his work and he absolutely loved his family," she told RTE's Morning Ireland. "He was a visionary - he wanted to make a difference in the world. He would light up a room when he came into it." Her son was due to relocate to Rome with his wife, Naoise, and his two young children. "I knew he was going on a flight to Nairobi. I didn't know he was on the flight that crashed until his wife, Naoise, contacted me," she said. "I was hoping he wasn't on that flight. "He was an amazing person - we cannot come to terms with this. We are devastated - no one can believe this has happened. "He was a very enthusiastic person, he had great vision he believed with his engineering in putting people first. "He said he felt he made a difference. He had a marvellous vision - he got there and he just did it." She admitted his family were always concerned when he travelled, particularly to parts of the world that were dangerous or risky. "We would always be concerned. I was talking to Naoise and we were always concerned. "But he loved his job and he loved his work. He was supported by his family and his wife at all times - it was his life. You couldn't take that away from him. "It is unreal - we are finding it very unreal to come to grips with it. "He did a lot of work with Ebola and with landslides and flood relief - he always looked forward to doing his best for people. He basically wanted to save the world. "He just wanted to make a difference in the world. He was so enthusiastic about it. "Next week we were supposed to go to Rome for him, for his 40th birthday, on March 28. His son was going to be christened in Rome as well. We have our flights booked to go next week - he would have been back from Nairobi. We were all going out to celebrate his birthday." Developmental aid worker with the United Nations (UN) Michael 'Mick' Ryan was the only Irish citizen on board the four-month old aircraft which crashed yesterday morning en route between Ethiopia and Kenya resulting in the death of all 157 passengers and crew. 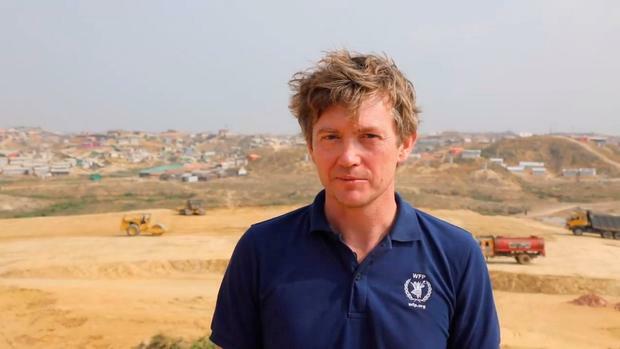 Mr Ryan, a native of Lahinch, Co Clare and a father of two young children, had been working as an engineer with the UN World Food Programme (WFP) over recent years. The Ethiopian Airlines Boeing 737 MAX 8 aircraft crashed just six minutes after it took off from Ethiopia's capital, Addis Ababa. It has now emerged the pilot reported difficulties with the aircraft, which is just four months old, and had been granted permission to return to Addis Ababa. This morning Evan Cullen, president of the Irish Pilots Association said it was "extraordinary" that a captain with a lot of experience would not have been able to correct the problem. "He was a very experienced captain with more than 8,000 flying hours. It was very likely that he flew a lot of Boeing planes," he said on RTE. Seconds later, the aircraft vanished from radar and exploded in a fireball on impact with open scrubland some 60km outside the Ethiopian capital. The death toll included citizens from at least 33 countries. Kenya suffered the greatest death toll. Mr Ryan was the only Irish national on board with US, UK, French, Chinese, Canadian, Italian, Dutch and Indian nationals also amongst the death toll. Locals in Lahinch and Ennistymon, where the Ryan family hail from, were last night heartbroken at the news of the tragedy. Outside the Church of the Immaculate Conception in Lahinch, one woman said it was "absolutely shocking." "I heard it this afternoon but I was praying it wasn't true and that there had been some mistake. They are a very well known and respected family here - I think his grandmother once ran a shop on the Main Street here," said the woman who asked to be unnamed. Another man said he spotted the engineer around Clare at Christmas. Prayers were offered at all Masses in Lahinch, Ennistymon and Milltown Malbay for the devastated family. Clare County Council has opened Books of Condolence for Mr Ryan at Áras Contae an Chláir in Ennis and at the West Clare Municipal District Office in Ennistymon. Cllr Michael Begley, Mayor of Cork, offered his condolences to Mr Ryan's loved ones. He said: "On behalf of Clare County Council and the people of Clare, I wish to extend my deepest sympathies and condolences to Michael’s family and his wide circle of friends and former colleagues. "Michael was a valued member of the UN community for his work in humanitarian assistance for the World Food Programme. His work brought him all over the world and has benefited countless numbers of people down through the years. "His loss to the local community in North Clare and to the United Nations is immeasurable. Ar dheis Dé go raibh a anam." Mr Ryan's immediately family were last night making plans to fly to Ethiopia to assist with the identification and repatriation of his remains. Mr Ryan was described in both Lahinch and Ennistymon, where he boasted many friends, as "a wonderful, compassionate man who lived for his job of helping others." He is the son of Christine and the late Jack Ryan. His mother is a retired teacher who was based at Scoil Mhuire in Ennistymon. His late father, Jack, who died in 2013, was a respected accountant in Clare. Mr Ryan is survived by his siblings, Cristin, Siobhan and Tiernan. In a special message, the Lahinch Parish last night extended the sympathies of the entire community to the Ryan family. "We pray for all who have died so unexpectedly in this tragedy, their families, colleagues and friends." "We pray for all working at the accident site at this present moment." "We hope that God will bless everyone in this tragedy for so many people." Mr Ryan was one of Ireland's most respected developmental aid workers. He had worked on various UN programmes across the world including high profile projects in both Africa and Asia. He was especially proud of a project he had worked on for the UN in Bangladesh. It is understood he was flying to a development project in Africa when the tragedy occurred. He was an engineering graduate of the National University of Ireland Galway (NUIG). Mr Ryan, an engineer, had been living in Cork city centre by Pope's Quay over recent years though he was due to relocate to Rome within a few weeks. He was a keen environmental campaigner and, using his engineering skills, had been closely following the controversial flood defence programme proposed for Cork. Mr Ryan had outlined his own proposals for the scheme and was a keen supporter of the Save Cork City campaign which aimed to avoid the use of high quay walls throughout the city centre. The Clare official had also closely monitored the success of the Mallow flood defence scheme on the River Blackwater. He had further put his engineering skills and knowledge to use through various heritage conservation programmes around Cork including as the Fota House Project. The UN World Food Programme confirmed they are liaising with the Ryan family over the tragedy. The Department of Foreign Affairs said it was doing everything possible to assist the family involved. The chief executive of Ethiopian Airlines Tewolde Gebremariam visited the crash site some 60km from the capital and extended his sympathies to all the families involved. Mr Gerbremariam confirmed that the pilot had reported difficulties and asked to turn back due to "no known technical problems". The airline boss said the pilot involved had an excellent safety record. One report from Ethiopia has indicated the brand new plane had an unstable vertical speed in the minutes before the tragedy. It is the second fatal accident involving the brand new Boeing 737 MAX 8 jet in the past six months. 29 2018 resulting in the death of all 189 passengers and crew. The US aircraft giant said it has offered to send a technical team to Ethiopia to assist with the investigation into the tragedy.